So begins Simon and Garfunkel’s most famous song, “Sound of Silence”. But how often do we see darkness as a friend? I confess that at these, the darkest days of the year, I long for light. I don’t like the sun setting at 4 pm. I love taking vacations to bright and sunny places. They don’t even have to be warm. Last week, when we were still in the midst of the inversion, I played hooky and went up to Bogus to xc ski for a few hours. I just needed SUN. I’m not really nocturnal either. When insomnia hits, and I find myself wide awake in the middle of the night, I rarely make good use of it. I stew and fret and wish I were sleeping. But then I heard a great interview on NPR this past weekend, reviewing a book about the joys and creative work of the night time. He collected stories of artists, musicians, and others who make good creative use of darkness. Rather than thinking about light leaking in, they described darkness leaking out. Because you need a certain amount of darkness to see some things more clearly. Do not open the door, for the darkness will leak out. This story has caused me to re-think images of light and dark in my life, and in Scripture. One of my favorite images to use in worship is light. You may have heard me say “The light shines in the darkness, and the darkness has not overcome it,” quoting the opening verses of John’s gospel. Darkness is most often a bad scriptural image. Later in John’s gospel, and frequently, he contrasts light and dark. You are either children of the light or children of the dark. And only one of those is a good thing to be for the author of John’s gospel. Apparently John was listening to Metallica’s Enter Sandman, gripping his pillow tight, when wrote his gospel. The dark is to be feared and avoided at all costs if you are a child of the light. But what I noticed about our passage from Isaiah, is that the darkness doesn’t exactly go away. Yes, they’ve seen a great light. And on them has light shined. But while light will cause the darkness to leak out, as the sign on the door said, it doesn’t get rid of darkness altogether. And we know that because we still experience darkness, not just in winter and with the infernal inversion, but in our relationships, in our work, in all aspects of our lives. I’ve heard many of my friends recently commenting on the darkness they feel. And at this particular time of the year—maybe it’s the lack of daylight, perhaps it is their expectations of what the perfect holidays should be—it seems to hit them harder than it does at other times. We know darkness, and we gather together at the darkest time of the year with candles to proclaim that on us a light has shined and it gives us hope that we’ll find that perfect balance of light and dark. And I know that in the midst of the darkest time of the year, we’d like the darkness to just go away. We’d like children to not get cancer or be shot at school. God became one of us, a helpless infant, subject to the darkness in the world, as we’ll read about in Sunday’s gospel reading, when King Herod kills all of the infants he can find, and Jesus’ family has to flee to Egypt. So, if God chose to shine light by being born in a stable in the midst of political unrest, maybe we need to reconsider how we see the darkness. Maybe we need to worry less about banishing all of the darkness, which can seem an endless task. Many people saw the birth of Jesus as the embodiment of Isaiah’s light shining in the darkness. And while Luke’s account doesn’t tell us the calendar date of his birth, the church has been celebrating Jesus’ birth at this time of year since the 4th century. Perhaps it is when we are in the midst of darkness that we appreciate our need for light the most. And for the people in Luke’s day, darkness was as real in their lives as it had been to Isaiah’s audience. Occupied by Rome, the people displaced and on the road at the command of foreign leaders. They knew darkness. And God responded to the darkness in a stable in Bethlehem. A child has been born for us. A son is given unto us. A light shines in the darkness. 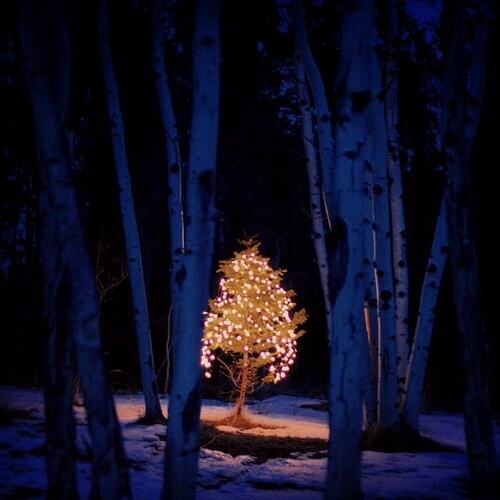 And Christmas, the birth of a child, is our reminder that the darkness never wins, because even small and fragile light makes a big difference. It calls us to shine light for each other, helping us through the darknesses of life. And a baby born to save us reminds us to consider the darkness in new ways. Luke tells us that after Jesus was born in Bethlehem, some shepherds were watching their flocks by night, in darkness. And this week, as I was considering darkness, I saw a video about some modern day shepherds, watching their flocks by night in a whole new way. Okay, I’m not sure they had the technology back in the day to have been doing that on the hillside the night Jesus was born. But isn’t that a great way of bringing light to the darkness? While the beginning of the video is impressive, it is once they put lights on the sheep in the dark of night that it became AWESOME! And it needed darkness to be as beautiful as it was. Friends, there is nothing I could say here tonight that would banish the darkness entirely. And anyone who tells you they can is lying. But what I can say is this—the light that shines is enough. We just need to adjust our vision so we can see by it. When I traveled to the Middle East in seminary, we went up Mount Sinai in the middle of the night so we could be on the top of the mountain when the sun rose in the morning. 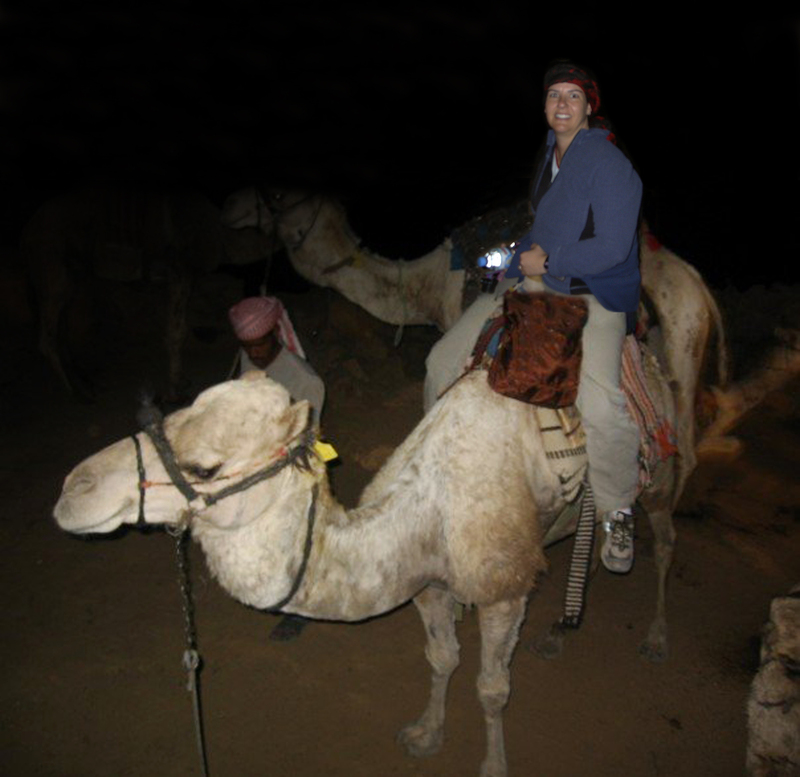 We rode camels part of the way up, but then we had to walk because the path was too narrow and tricky. And we discovered it was easier to walk without using our flashlights or headlamps. Because they showed a bright light in one spot, where the beam hit. But that light blinded us so we couldn’t see the rocks outside of the light beam. When we turned off our flashlights, allowed our eyes to adjust, and walked by the light of the moon, it was enough. We could see where we needed to go. And when the sun rose that morning, it didn’t happen in an instant. It was gradual. The color of darkness became less opaque, the inky blackness started leaking out. The stars were no longer visible, but mountains and plains on the horizon came into view. And then it was day. And even though I couldn’t see the darkness in the broad day light, I never forgot it had been there with me all night. In a little while, we’ll light candles in the darkened sanctuary. And we’ll go out into the dark of night with refrains of “Silent Night, Holy Night, Son of God, Love’s Pure Light” ringing in our heads. And I invite you to take that light with you in your heart. Because unto us a child is born, a light has shined on us. So go and share that light with a world that needs to know that while the darkness is still with us, it will never win, and the lights we shine in the darkness can create some beautiful moments in the midst of it all. 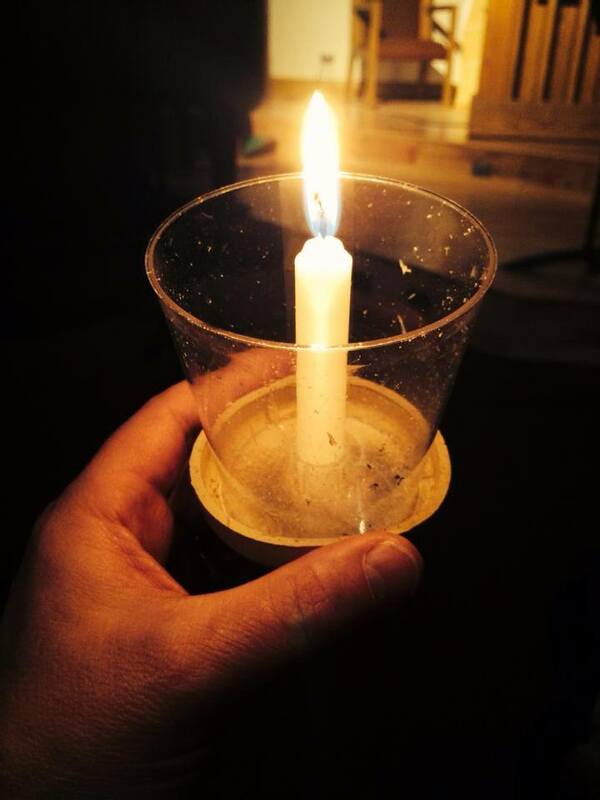 December 24, 2013 in Christmas Eve, extreme shepherding, Isaiah 9:2-7, light and darkness, Luke 2:1-20, Sermon.